The Stelvio Pass road, which connects Bormio to the South Tyrol and to Switzerland is a dream for those who love the mountain roads rich in hairpin bends. 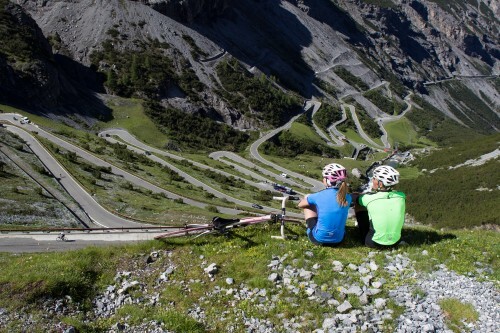 A route over the Stelvio Pass has existed since the Middle Ages, but for a long time it was a dangerous mountain path. At the beginning of the Nineteenth Century, the Emperor Francis I of Austria wanted a new road that would connect the Venosta Valley to the Valtellina, and from there to Milan, at that time Austrian territory. The project was entrusted to Carlo Donegani (1775-1845), an expert in high mountain engineering. The work began in 1820 with the employment of more than 2,500 workers, engineers, and geologists, and after just five years, in 1825, the new road was inaugurated in the presence of the emperor himself. Equipped with tunnels, switchbacks and avalanche barriers, along its route were four road worker’s houses for use by wayfarers and “rotteri”, those tasked with clearing the road. The houses were operated by “cantonieri” who lived there throughout the year and who had the task of ringing the bell to help travellers stay on the road in case of bad weather. The church at the third road-worker’s house was built in 1830 for the spiritual assistance of wayfarers. It is named after Saint Ranieri in honor of the archduke viceroy of Lombardo-Veneto (of the same name), who, as a sign of gratitude for the dedication, paid homage to church with a valuable canvas depicting Saint Ranieri praying, by artist Francesco Hayez, now kept at the Bormio Civic Museum. Next to the church is the small cemetery built to guard the mortal remains of the fallen during World War I along the Ortler-Cevedale front. The neighboring mountains still retain numerous trenches and fortifications bearing silent witnesses to the difficulty and stress to which the soldiers were subjected when forced to remain in their positions throughout the winter, with sub-zero temperatures, and at elevations in excess of 3000 meters above sea level. Until 1915 the Stelvio Pass Road was used throughout the year by travellers and merchants, thanks to the efficient work of men employed to shovel snow during the winter. During World War One, it was host to a number of clashes between the Italians and the Austrians, and after the armistice of November 4, 1918, both sides became Italian, and the Pass lost its original significance in connecting Vienna to Milan. At that time, it was decided to close the Stelvio Pass in winter and today it is only passable from the end of May to early November. The route is spectacular, with 40 hairpin turns on the Lombard side above Bormio, and 48 more on the South Tyrol side above Prato allo Stelvio, in the Venosta Valley. Ascending from Bormio, you can reach the Umbrail Pass (8211 feet/2503 meters) which allows the entry into Switzerland and the descent to Santa Maria in the Monastero Valley. At the summit, the legendary Stelvio Pass (9048 feet/2758 meters) is the highest automotive pass in Italy and the second highest in Europe.